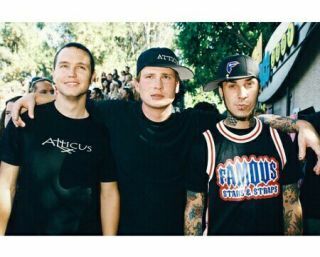 No official announcement has been made, but an informed source has revealed that newly reunited pop-punksters Blink-182 will tour this summer for the first time since 2004 and are taking Weezer along as their opening act. Although it strikes us as odd that Weezer would agree to be a support band (why not a co-headline bill? ), the pairing of the two groups promises to be a big draw. Since Blink-182 announced their reunion at this year's Grammy Awards, fans have been eagerly awaiting some sort of word as to when a tour would be a reality. Singer and bassist Mark Hoppus stoked fan buzz when he released a picture to the 200,000+ followers on his Twitter page of the band's possible setlist. This prompted Fall Out Boy's Pete Wentz to suggest that Blink include the song Stay Together For The Kids in their show. Hoppus says they will - even though the tour hasn't been announced. But wait...he's got a setlist. See?